Downfield Primary School is a non-denominational Early Years Centre and Primary School, catering for ages 2-11. We are situated in the west side of Dundee, serving Downfield and Kirkton. We have 400 children in P1-7 split between 15 classrooms and up to 100 children (50 in the morning and 50 in the afternoon) in the 3-5 year old nursery. Our 2 year old room holds an additional 30 children (15 in the morning and 15 in the afternoon). We look to nurture in our children positive attitudes to learning, achievement, relationships and to support them to develop a growth mindset. We support the children and each other to develop the skills our children need to enable them to live fulfilling lives and to make a positive contribution to our community and the wider world. To this end we build effective partnerships with our families and the wider community so that together we can share the important task of preparing out children for the opportunities and challenges of the future. We do this so that our children can maximise their potential, are aware of the opportunities life has to offer. We want our children to have the skills and attributes they need so they can do, have and be what they want in life and follow their dreams. We as a school community will make a promise to each other to support each other to help and nurture our children to be the best they can be, make good choices and develop the skills they need to do well as they make their way in the world. 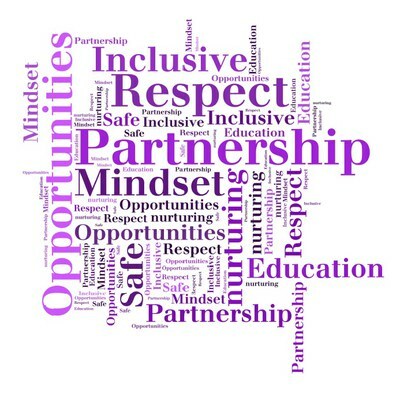 We believe that education, behaviour and values are all part of the community and welcome the growing home/school relationship as we all work together to help all children be the best they can be.